JIM COLLIGAN PHOTO A bath in the sunshine. A harbor seal enjoying the day on a rock off Shelter Island. Jim Colligan caught this harbor seal taking an afternoon nap on a Westhampton beach this week. DON BINDLER PHOTO | Winter loungers. 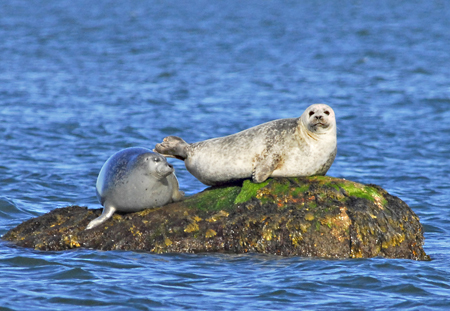 Shelter Island photographer Don Bindler submitted several shots of lolling harbor seals earlier this month. This picture didn’t make the paper: a bull and, probably, his mate on a rock on the Ram Island causeway in the sunny afternoon of February 6.